A matryoshka doll also known as Russian nesting doll refers to a set of wooden dolls of decreasing size placed one inside the other. The first Russian nesting doll set was carved in 1890 by Vasily Zvyozdochkin from a design by Sergey Malyutin, a folk crafts painter. Traditionally the outer layer is a woman, dressed as a traditional Russian peasant. The smallest, innermost doll is typically a baby carved from a single piece of wood. Much of the artistry is in the painting of each doll, which can be very elaborate. The dolls often follow a theme, from fairy tale characters to Soviet leaders. My own matryoshka doll from Ukraine is usually nestled between two volumes on my library shelf: Arthur Gordon’s A Touch of Wonder, and A Treasury of Religious Verse. But now on display during this season the largest doll tells the story of Christ’s nativity . . .
. . . and, un-nested, the story of his subsequent life on earth unfolds, culminating in the Crucifixion and Ascension. That\’s beautiful! So often people try to separate the birth from the crucifixion, so it\’s lovely to see the whole story together instead of segmented. Images often do that better than words. Thanks for another astute observation, Traci. Merry Christmas to you and your kin. What a beautiful and unusual way to say Merry Christmas. Loved the story and the pictorial doll. There\’s a story in every picture isn\’t there? From sunny, warm California, we all wish you and Cliff abundant blessings. Like Traci, \”another astute observation,\” Carolyn. We were in shorts and sandals yesterday, but today feels a little more Christmasy–temps in the 60s, not bad. Merry Christmas, Carolyn, Allen, and all the CA gang! Marian – A truly beautiful progression! May this holiday season smile gently upon you and yours, and may the New Year bring you light and joy. Thank you for the compliment and for the new year\’s wish of \”light and joy,\” I like that–and hope the same for you. Grandson Owen loves our own Russian dolls. I will show him these pictures on the computer, and I\’m sure he will be excited to see them. We got our set in Prague a few years ago. 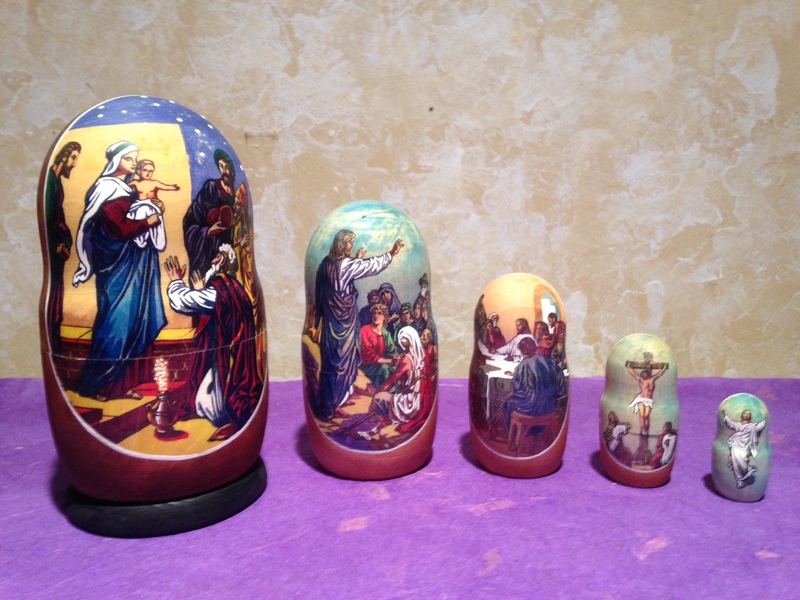 Knowing the story of your time in the Ukraine makes your Matryoshka dolls even more beautiful. I love the connection between memories and objects. Merry, Merry Christmas to you and yours. We are both so fortunate to be able to impress our grandchildren with our memories, and artifacts. Appreciate the heritage, love being able to pass on a rich legacy. 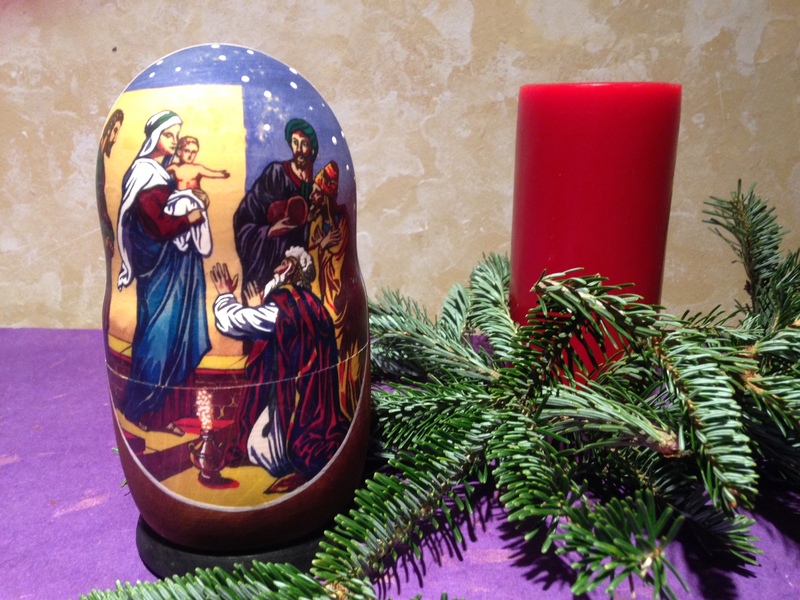 When we were in Prague, I remember puppets and light shows but don\’t remember Matryoshka dolls although I\’m sure they were right under my nose. All good wishes to the Showalter family!